Or use any chopped seasonal fruit! 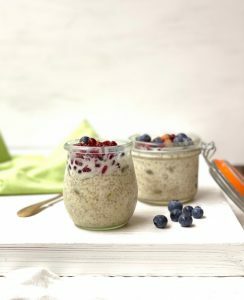 Place cooked quinoa in a small mixing bowl with milk, chia seeds, pepita seeds and maple syrup. Cover and allow to rest in the fridge overnight. The following morning, top mixture with yoghurt and stir to combine. Dish up half the mixture into a portable container (e.g. mason jar). Top with fruit and chopped nuts of choice. Store remaining mixture in fridge for up to 2 days. Use pre-cooked quinoa tubs or pouches from the supermarket to save time. Recipe and image kindly provided by Kathleen Alleaume, founder of The Right Balance – for more recipes visit her website.